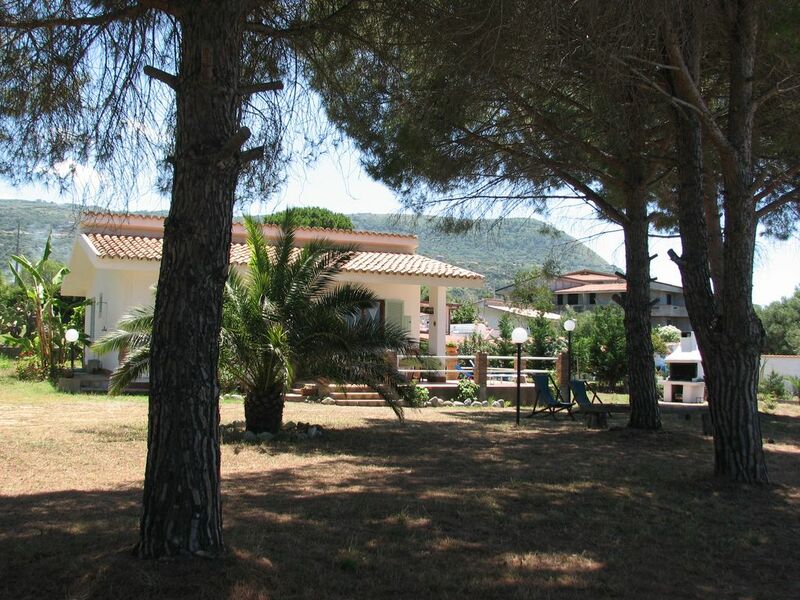 Quiet place lined with trees.The location boasts a striking view of the Tirreno and of the sea cliff of Capo Vaticano. When the weather is good,the tourist can enjoy the charming view of Sicily and the Eolie Islands. A little gem in an lovely location. with everything you need (bar a kettle, its an english thing!) Nice views out over the sea between the homes in front, and perfectly peaceful and quiet. The beach is excellent and amenities are all there and the steep 300m walk is quite easy. Its not far from Tropea, about 7km and the train which runs past the back of the property goes back and forth round the peninsular. We took it to Scilla, stunning, and it was a good fun trip with nice views along the way. You have to change at Rosarno (ghastly) its a 45 min wait outward but 5 minutes on the return, but more than offset by the terrific lunch over the sea in the Chianalea area. All along the route to Tropea are supermarkets and produce shops and some great fish stalls which twice a day, cook it for you at their tables etc. Very civilised and I wish it would catch on elsewhere. Thoroughly recommended and the Russo family were exemplary hosts. Having no airport, this area is a gem for the italians and you won't hear too many other accents. My idea of heaven. I dont usually do repeats, but this one is tempting. Nigel and his wife enjoyed the house, simple but cozy, and especially the surroundings. Unfortunately in this area thare are few english travellers but thanks to this wonderful feedback I am sure that other english people will choose to spend their holiday in Calabria. We chose this property for our summer vacation in 2016. Two families stayed in two close-by houses on a large linked territory, which was very much enjoyed by our kids (altogether 5 kids, ages: 14, 13, 12, 7, 3) for games and wander-about! First of all, the hosts are very friendly - special thanks to Stefania and her family who assisted us in any possible way that can be imagined! The beach is some 7-8 minutes walk from the house down the steep hill, the return requires some good fitness effort, but this was enjoyed as well after all the pasta and gelato that we had - nice daily exercise to keep up with the shape! Ideally a car is very useful during the stay here, as some spectacular, picturesque beaches (Capo Vaticano, Baia di Riaci, Tropea) are just 10-15 min drive from the houses, so it's well recommended. Public transport is available too, shuttle bus stop is 10 minutes walk from house and the bus can take you to Tropea in half an hour. Tropea is absolutely fantastic, marvelous small town with splendid atmosphere! Tropea by night is a must see experience, indeed. From Tropea we went to Pizzo by train (trains are regular and convenient, kids liked them a lot) - another town recommended for visit at least to try the famous ice cream called Tartuffo (one can find various kinds of it in local gelaterias), but also a historic Castello Murat provides impressive historical flash-back. The village where villas are located - Santa Maria di Ricadi - is a small and cozy; market is located on your way to the beach and you can buy practically anything you need there. Couple of restaurants are also in the vicinity with fish dishes, pizzerias, pasta - all affordable, tasty and with nice service. We were looking for some solitude during our stay and this was achieved - during couple of days there were few men who cut grass in near-by properties a bit too early in the morning, but when we asked them to start at later hours, there were no more noise that disturbed us. The villa house is spacious and ideal for even a large family. Clean bed linen was delivered on weekly basis. The owners were very helpful and were kind to pick us up from and then give a lift to Ricadi station on our way back. They even treated us with home-made wine and nduja (local sausage), helped us when our small baby got sick from overheat, etc. During the stay we felt that we were well taken care of! Definitely would recommend this villa and hopefully would return there once again in future! We had a very nice week in Ricadi with out three children of 19, 21 an 23 years old. The family Russo took very good care of us. They helped us a lot during the three days that four of us didn't have our luggage . The also brought us a lot of vegetables. The house is basic, but has every thing you need to have a pleasant stay. There is a large garden, with lots of shadow. There are sufficient chairs and deckchairs. The house is in a private area with about 5 similar houses; all belong to one Italian family. You wouldn't have known if Stefania didn't tell us. The family lives everywhere in Italy and comes back to Ricadi for the Summer holidays. Only one is a holiday rental. The view on the front is outstanding: a very nice seaview and also beautiful sunsets at the end of the day. We went to the beach by walking every day. It is about 7 minutes walking downhill, and 10 minutes uphill (of which a small part very steep, so very good exercise!) When you came back, you directly can use the outside shower to cool down. The beach is sandy, spacious and clean. Close to the beach there are several bars and restaurants. At one of them you can eat with view on the beach and sea. Very nice. There is also a church/chapel at the food of the beach, which is a nice view, when you come walking down the hill. Close to the beach there is also a small supermarket, where you can get fresh bread in the morning. Stefania Russo speaks very good English (she studied English language and lived for several months in Ireland). Mrs. Wilna and and family have been our guests for 1 week. They are a very nice family and very respectful peolple. I am very pleased they liked our summer house and especially the surrounding. They enjoyed the relaxing atmosphere and the wonderful seaview our house boasts. It was very nice to meet Wilna and her family and I hope to see them again. I wish them all best in life. "House and its big private garden are both very nice and convenient for the rest, location and view are great. Short road to the beach is steep downhill but it''s healthy after wonderful italian food and wine :)"
"Absolutely amazing holidays, most kind and warm people. Beautiful surroundings, 1st class lodging. From the Salerno-Reggio Calabria motorway(A3)or from the airport of Lamezia Terme exit at the junction of St. Onofrio. Then continue to Vibo Valentia (5 km) and then to Ricadi, Piazza Guglielmo Marconi, (30 Km). At the arrival, please call me. typical plates, the festival of'nduja (Spilinga August 8) and the festival of the 'red onion' (Ricadi August 13). There are other typical festivals in the neighbourhood.